Sam still has nightmares about the moment the ocean “swallowed up” her three-year-old son during a family boat trip. One minute the lower North Shore mum was filming Richard splashing his feet on a platform on the side of the boat and the next he had jumped in and disappeared under the water. “We dropped the anchor in a Sydney harbour beach and the boat was in really shallow water – we took off our life jackets on the sand,” Sam recalls. “Richard and I decided to go back onto the boat for a snack while my husband was on the beach with my two-year-old daughter Matilda. The boat started to drift out from the shore into deep water, to the full extension of the anchor chain. As they were intending to duck onto the boat for a short time only and in shallow water, they were not wearing their life jackets. While Sam had realised the boat had drifted from the shore, she didn’t think to mention it to Richard, assuming he had also noticed and would remain safely in his spot. Amazingly, the survival skills that Richard gained at Learn to Swim classes at Ku-ring-gai Fitness and Aquatic Centre (KFAC), managed by YMCA NSW, kicked in. He surfaced a short distance away and then floated on top of the water. “Richard was absolutely fine and calm – it was a real credit to him that he didn’t panic and didn’t breathe in any water,” says Sam, who swam Richard, still floating on his back, back to shore. “He did everything he was taught to float safely to the surface. He didn’t actually know how to swim but he certainly knew how to save himself. 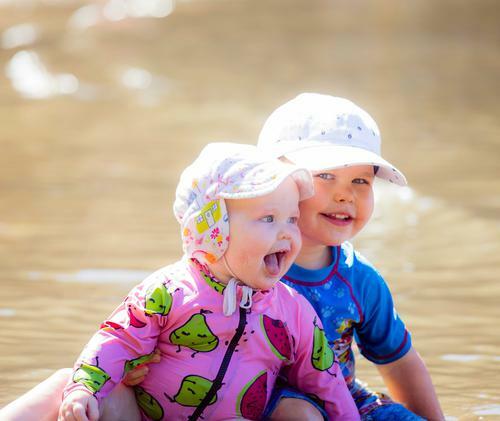 The Royal Life Saving National Drowning Report 2018 released this month (12 Sept), reveals children under the age of five remain at the highest risk of drowning, with 18 deaths recorded in this age group in 2017/18. This figure represents a 38 per cent reduction when compared to last year, and 36 per cent against the 10 year average. The report says that while the reduction in deaths is pleasing, “parents must continually be reminded to keep watch”. National Learn2Swim Week is being held during the October school holidays from October 2 to 9, aimed at educating parents on the importance of teaching children under age five to swim. During this week, swimming lessons will be offered free to children under age five at 400 participating swim schools around Australia. This includes KFAC and other Learn to Swim centres managed by YMCA NSW. Sam is happy to share her account of what happened to Richard in March this year as a cautionary tale to other parents. She says while her family wears life jackets when they are travelling in the boat, she realises how hypervigilant all parents need to be to keep children 100 per cent safe around water. “It really brought home to me and my husband just how quickly something can go wrong,” Sam says. “We have no doubt that the situation could have been far worse if Richard wasn't equipped with the level of water confidence and competence instilled in him every week by the YMCA NSW team. KFAC Learn to Swim School Coordinator Xina Hudson says she and Richard’s swimming teacher Dana Trebar are incredibly proud of him for using the skills he learned in swim class to help save his own life. “The fact that he could remain calm and not swallow water, rather blow out bubbles and float just highlights how important water safety skills and awareness are at such a young age,” Xina says.